Time to sell your Phoenix condo? Read about today's resort-market buyer. RENTAL TIPS to maximize your condo's revenue. Visit our Alabama Gulf Coast Condo Revenues page to view annual rental income for Phoenix I and all other condos. We can help with your Phoenix condo investment. Guests at Phoenix I and Phoenix II enjoy a wealth of amenities, both outdoor and indoor. Outdoor pools and kiddie pools are sure to keep both younger and older kids entertained while their parents enjoy the hot tub. Onsite lighted tennis courts are also popular with friends and family who like a bit of healthy competition. There are also indoor racquetball courts in both resorts. State-of-the-art fitness centers offer the perfect place to keep up with your daily workout before heading into the sauna to relax and get ready for the rest of the day. Head over to the grills and cook up your latest catch or some burgers to enjoy during a picnic on the beach or in one of the gazebos. Of course, nothing beats a day spent playing the Gulf of Mexico or just stretching out in the sand to enjoy the sun. And what better way to end the day than to relax on your private balcony and watch the sunset over the Gulf? Phoenix I and Phoenix II condos are located next to one another in Orange Beach, AL. The 2 towers each house 100 units comprised of 1, 2 and 3 bedroom condos; built in 1985. Phoenix condos rent great are well maintained and make ideal investment properties. Please let us know if you would like further info for Phoenix I and II or any other condos, homes or real estate along the Gulf Coast or would like to schedule a private viewing by emailing info@condoinvestment.com or by calling 251-Area-Pro (251-273-2776) for immediate assistance. Orange Beach, Alabama is a highly sought-after beach destination and a great place for family vacations or a romantic getaway. 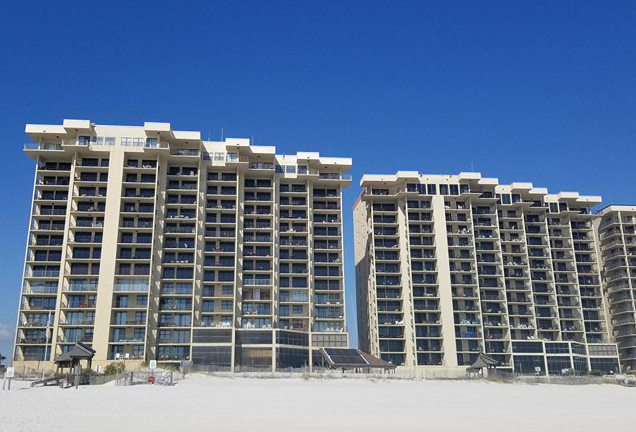 It is no surprise why real estate in Orange Beach is booming with a number of newly built condos and pre-construction condos. Get a better deal on a condo and buy early at the pre-construction rates. Investors can find a myriad of sales data including annual revenue information for each condo, recently sold condos, in addition to sold prices and closed dates. Using pre-defined searches and our interactive map, easily find Orange Beach condos for sale on different types of water frontage whether its direct gulf front, bay view, canal access, etc. We provide endless informational resources for properties in popular Gulf Coast cities including Mobile, Fairhope, Pensacola, Destin, and Panama City, Florida. As an added convenience, Condoinvestment.com provides mobile-friendly pages making it easier for users to browse and view HD quality aerial imagery and videos for real estate throughout the region.